Google’s Penguin 2.0 went live on 22 May to the surprise, and dismay, of SEOs and webmasters around the globe. Conversations and interviews with Matt Cutts, Google’s search spam guru, in early May lead many to believe the launch was still “weeks away,” but Penguin 2.0 was launched just a few days later and its impact has already been felt by a number of websites. One of the major targets of Penguin 2.0 was links and link building practices. Google has long detested poor link building practices, whether that consisted of existing links to dead pages or purchased links from link providers that often consisted of little more than “spammy” content. With the launch of Penguin 2.0, these link building practices were targeted for punishment and a number of otherwise clean websites began to suffer because of poor link practices. Among the most common problems these otherwise upstanding websites suffered from were links to websites that were no longer active, as well as links that directed users to malicious content. Cutts highlighted in interviews and blog posts prior to Penguin 2.0’s launch, as well as during blog posts as Penguin went live, that webmasters could clean up their links and avoid punishment with the help of Google’s link Disavow Tool. Using the tool, SEOs and webmasters can report links which cannot be removed manually to Google and sever connections that way. However, it appears that numerous users have been struggling to use the Disavow Tool appropriately and are still being punished by Penguin 2.0. As a result, Cutts posted a video to the Google blog on 11 June offering up some of the most common mistakes they are seeing from SEOs and webmasters when using the Disavow Tool. In doing so, Cutts is not only throwing a bone to users but also attempting to achieve another Google goal; better communication with webmasters and internet marketing companies. Too Specific: When users are reporting links to the Disavow Tool they are often being too specific in listing individual links, even when those links come from the same domain. Cutts recommends users take a more “machete-like” approach and simply disavow entire domains. Using a “domain: name” command users can disavow an entire domain at once, nailing all the links from it in one swing. Poor syntax: The Disavow Tool is not perfect and is capable of stuttering when users have poor syntax in their files. This poor syntax leads the program to toss out requests, leaving those bad links on pages. Save the Story: Users are putting the whole story behind disavowing links inside their TXT files submitted to the tool, again causing the system to raise flags and toss out requests. The reasoning behind links that are being disavowed should be included in the reconsideration request section instead, according to Cutts. Keep Comments Short: Cutts pointed out that many users are putting too many comments in their TXT files or using poor syntax doing so, and again causing the system to raise flags on their requests. He went as far as pointing out that in some cases users might be better off not commenting on the links they are disavowing. 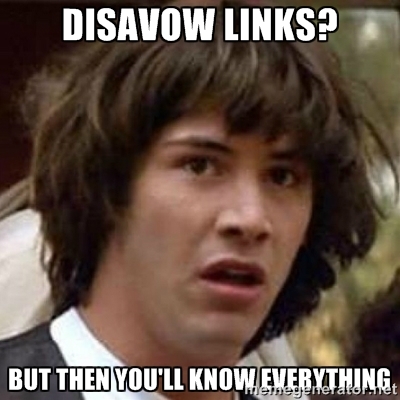 System Can’t Do It All: The Disavow Tool isn’t there to help webmasters clean up all their bad links. While it can do a great deal to help rid a site of particularly tricky spam links, it cannot do all the work. Webmasters will need to put in some manual effort on their own to remove poor links in order to get out from under Penguin’s scrutiny. Most importantly, as noted by Cutts, improper file uploads have been the biggest sticking point for many users. All files uploaded to the Disavow Tool need to be in simple TXT file format. Many users have been uploading Word files (.DOC) and Excel spreadsheets, and as Cutts explains, the system is not set up to read those files and tosses them out. While many SEOs and webmasters have rightfully worried about the impact Penguin 2.0 will have on their rankings, they cannot accuse Google of cold-heartedly unleashing Penguin on the web and not helping them adjust. Following Cutts’ advice should help a number of users get around any link trouble they’ve been having.